Industrially rated truck and trailer units are available on various truck sizes and configurations. 1.) 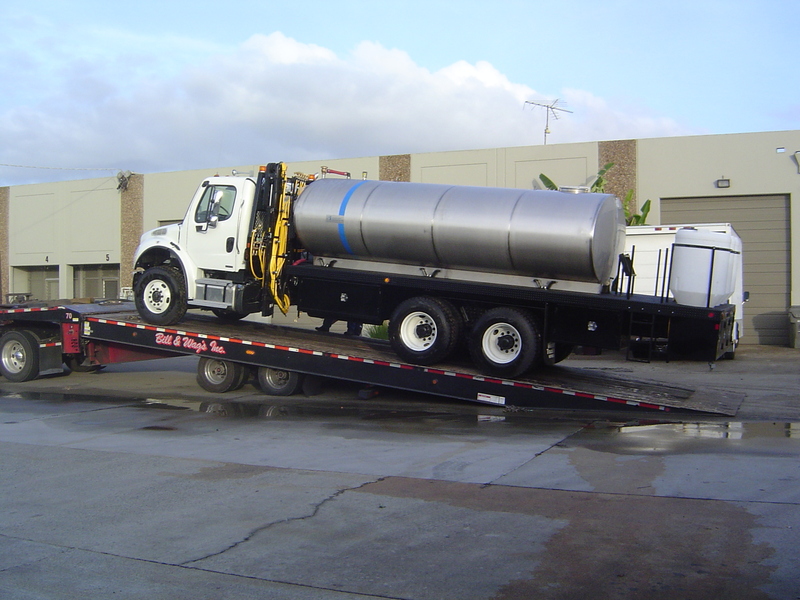 300/500/750/1000/2000/3000 gallon water capacity, manufactured in rotation ally molded polyethylene tanks, fiberglass tanks or stainless steel tanks. Large capacity tanks will be equipped with appropriate anti-surge baffles and in either leg mount or metal saddle design. 2. )Gasoline or diesel fuel engine/pump units with a horse power range of 5HP to 40HP and a product flow rate from 10 to 85 gallons per minute using centrifugal or diaphragm pumps. Heavy duty, ceramic lined piston pump units are available in the 6 to 45 gallons per minute range for use in high pressure tree spraying application equipment. 3.) 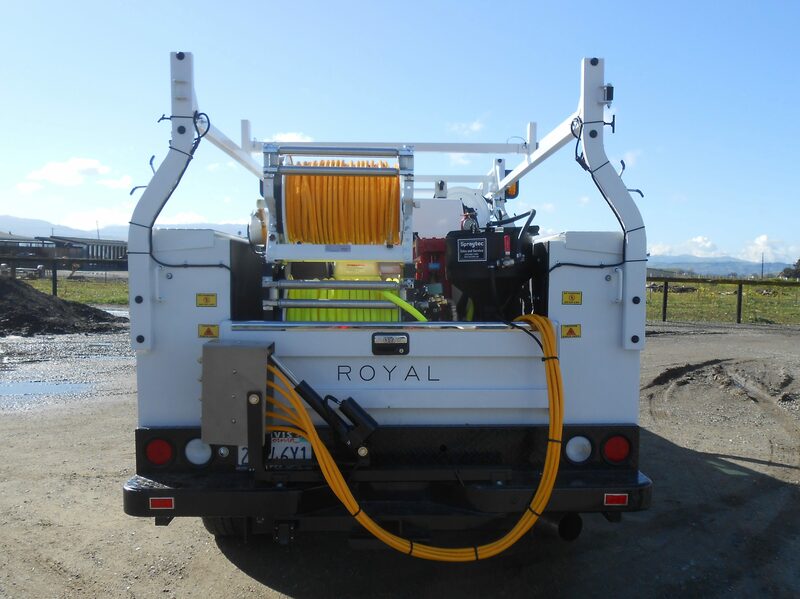 A full range of custom fabricated spray booms and boomless spray head assemblies are available to provide maximum application efficiency with in-cab controls for roadside and/or broadcast spraying with individual right/center/left variable swath width control. 4.) High quality Hannay manual or electric rewind reels with 50/100/200/300 feet hose length capacity and hose roller assemblies to provide smooth pay out and rewind. All hose reels are supplied with heavy duty multi ply reinforced PVC spray hose with a ribbed exterior cover to facilitate easy handling. 7.) 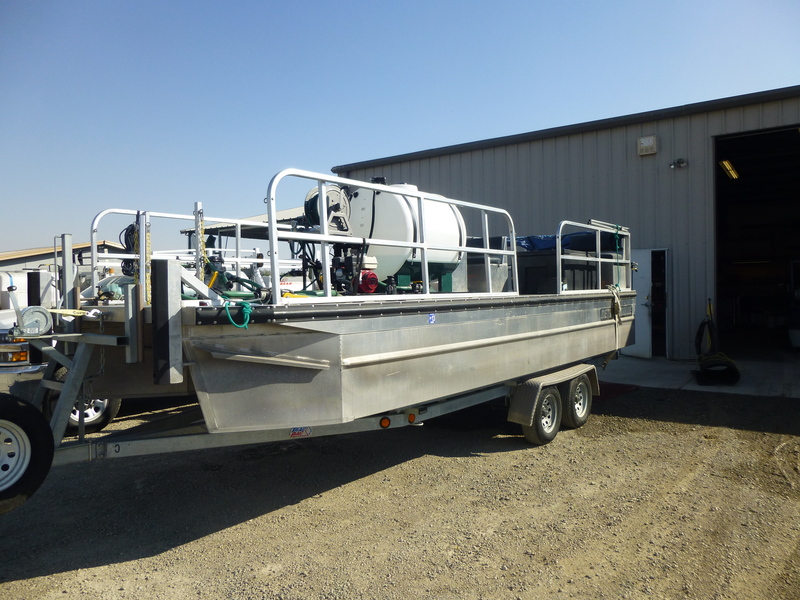 Custom truck bed design with required CA DOT lighting, supplemental utility lamps, traffic controllers (strobe lights and/or light bars) plus custom fabricated truck storage and tool boxes all available upon request. 8.) Full factory warranty on all whole goods and twelve month warranty on fabrications and systems.